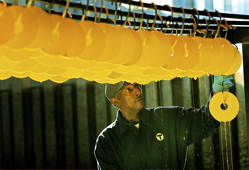 The MBTA’s Charles Dailey inspected newly painted spacing devices made by the T’s blacksmith shop. Blacksmith Michael DiClemente works with a piece of steel. 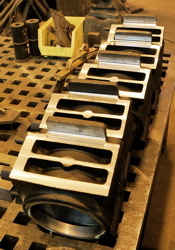 Housing units for journal bearings are lined up on a bench. After starting with metal rectangles, Peter Genna, 29, is making pole brackets on a machine in the Everett blacksmith shop. The part is unique to Blue Line trains. Photos by David L. Ryan ©Copyright 2007, Globe Newspaper Company. Working amid roaring furnaces and rusty anvils, blacksmiths forge hot steel into switch sticks, pole clamps, shepherd sticks, and other spare parts that long ago stopped being manufactured. But these are not shipbuilders or ironworkers. These are some of the MBTA’s [Massachusetts Bay Transportation Authority’s] six blacksmiths [members of Local 651, Somerville, Mass. ], all working harder than ever to keep Boston’s aging trains, trolleys, and buses running. ‘‘Things are getting crazy around here,’’ said Michael DiClemente, 39, of Medford, whose father was also a smith. As the T fixes the ancient Mattapan trolley line, its President’s Conference Committee cars, delivered in 1945 and 1946, are getting new parts, many made and hammered by hand in the blacksmith and metal shops. ‘‘You just can’t buy them, so we have to make them,’’ said Fred Rooney, section chief of the T’s Everett Main Repair Facility, a modern brick building the size of an airplane hangar. Traction motors from the aging Red and Orange Line cars are spread through the warehouse. The facility rebuilt 357 such motors in the last three years; the blacksmiths crafted the crucial mounts to link motor to chassis. As the T prepared for winter, when aging motors often clog with ice, the shop received an order to rebuild 34 Orange Line traction motors in a week. This month, the blacksmiths are rebuilding 53 motors for the Red Line. Most other big-city transit systems don’t have blacksmiths, sending the work to outside firms or using newer equipment that requires few major repairs. In 1995, the Massachusetts Bay Transportation Authority got rid of its blacksmiths while trying to save costs. Over the following five years, however, they were hired back, their jobs too important to the health of the 110-year-old system. They continue to use equipment that hasn’t changed much in centuries. Their desks are blast furnaces that can reach 2,300 degrees. The shop’s air-power hammer, which can flatten hot steel, dates from the 1950s. At one point there was a metal press from the 1890s, complete with a dangerous and unpredictable flywheel that could make a safety inspector faint. ‘‘It’s a living organism out there,’’ Rooney said, [who works] in a graveyard of bent and broken trolley pantographs, the wire and metal apparatus that connects a trolley to overhead power lines. ‘‘And we can repair it all,’’ said Buddy Pickman, his foreman and blacksmith. 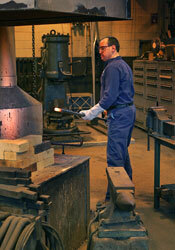 T officials say the blacksmiths’ work is also a way to cut costs. Switch sticks, long metal poles used to manually shift track switches, are continually lost or broken by workers. Rather than spending thousands to have them manufactured and delivered from elsewhere, the T can do it with spare metal rods and the blacksmiths, Rooney said. The blacksmiths also make shepherd sticks, used to pry bus tires off their rims, so the T doesn’t have to buy them. A wheel scissor hoist that can lift 600-pound rail wheels? Made by the blacksmiths. Other tools used in daily maintenance at the T but never given formal names? Blacksmiths. ‘‘If you walk through this place, we touch every part that’s in here,’’ said DiClemente, as Peter Genna, 29, of Bradford, finished pressing metal rectangles into pole brackets unique to the Blue Line. Pickman and Rooney supervise two young welders who are learning the trade, but there’s some concern that no one else is coming forward. ‘‘It’s kind of a lost art,’’ said Thomas Long, a supervisor at the shop. The T blacksmiths are members of the International Brotherhood of Boilermakers, Iron Ship Builders, Blacksmiths, Forgers, and Helpers, who in the mid-1980s represented 33,850 [blacksmith] workers. But much of the work has since gone overseas. ‘‘When we had our 2001 convention, that number was down to 1,800 [blacksmiths],’’ said Jim Pressley, assistant to the International president. At the last union convention DiClemente attended last summer, he said he met no one representing blacksmiths.